Retinopathy of prematurity, called ROP in the medical community, affects premature infants and newborns. The disease can be mild or severe. When first diagnosed in the 1940s, the condition was called retrolental fibroplasia. At that time ROP was the number one cause of childhood blindness. With advances in medical technology and treatment, smaller, younger infants are surviving and the rate of ROP is on the rise. How Does Retinopathy of Prematurity Develop? The vessels of the retina develop around the 16th week of gestation. During this time, these vessels grow from the optic disc. By the 32nd week of gestation, development from the ora serrata to the nasal area of the retina is complete. Development continues until the end of pregnancy with the large temporal area developed by the 40th to 42nd week of gestation. Experts believe gap junctions caused by hyperoxic extrauterine conditions may be the cause of ROP. The “gaps” make it difficult, or impossible, for proper vascular growth. 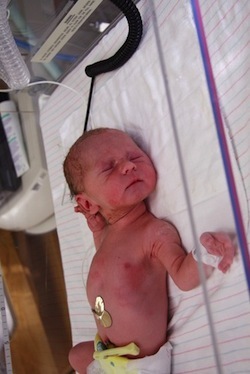 It is estimated at up to 50% of infants born weighing less than 2.75 pounds at birth will develop ROP. ROP often leads to irregular blood vessel growth after birth. There is little known about why some cases of ROP resolve with immediate treatment and other cases advance. Two infants presenting with the same clinical condition can be subject to identical treatments and one patient may resolve while the other develops a more severe condition. Experts suspect genetics play an important part on treatment effect. There are five stages of ROP. Patients are assessed for various factors before the disease is staged. Stage 1: Mild abnormalities in vessel growth. Stage 2: Moderate abnormalities in vessel growth. Stage 3: Severe abnormalities in vessel growth. Stage 4: Severe abnormalities in vessel growth with partial retina detachment. Stage 5: Complete retinal detachment. The aim of treatment is to stop irregular blood vessel growth. Cryotherapy or laser therapy may be used to stop vessel growth. If the retina has detached, laser therapy is not an option. Doctors may suggest surgery to reattach the retina. About 10% of infants with ROP will develop a more severe stage of the disease. Lasting vision problems and blindness may occur. However, most mild cases resolve with treatment.